This beautifully illustrated lecture tells of two 600 mile canoe journeys across the remotest area of the North American continent in the brief summer of the tundra. A pristine wilderness of dramatic scenery and magnificent wildlife. This huge triangle of land to the west of Hudson Bay was called ‘The Barrens’ by early explorers, but in the summer, at least, it seems a misnomer. Wild flowers carpet the ground and a hundred species of birds arrive to feed and breed. Many species, including wolves, musk-oxen, foxes, lemmings, wolverines and grizzly bears live there all year round. Very large trout and arctic char populate the rivers. Most spectacular of all are the herds of caribou, numbering several hundred thousand animals, whose migrations are one of nature’s most magnificent spectacles. Yet even in summer it’s wise not to get too relaxed. Large lakes can remain frozen until late July, and temperatures can plummet from 25 degrees to near freezing in a matter of minutes. Sudden gales can transform calm lakes into a deadly hazard for canoeists, or keep the traveller cowering in his tent for days. In a flight lasting two and a half hours a float plane took John and his Czech companion from the isolated mining town of Yellowknife on the shores of Great Slave Lake (the 10th largest in the world), to the still-frozen headwaters of the Thelon river. They paddled for six weeks through canyons carved by wild stretches of rapid, across a landscape that sometimes looked as though the glaciers had only retreated a few years ago, through the Thelon Game Sanctuary, a 21,000 square mile area originally created in 1927 to conserve ‘wildlife in general, and muskox in particular’, and through large icy lakes to the Inuit community of Baker Lake. Then on to Churchill, where the Hudson Bay was full of white Beluga whales, and where the polar bears were already scavenging in the refuse tip as they waited for the sea to freeze. This lecture includes the tragic story of the legendary John Hornby, the English-born ‘Man of the North’ who starved to death with his two companions on the banks of the Thelon in 1926, and where the remains of his cabin still exist. John talks about the history of the Hudson Bay Company and the early explorers, and the nomadic peoples who roamed this harsh land for centuries following the caribou. John gives graphic and humorous accounts of their nervousness when sleeping in flimsy tents in grizzly country, and their encounters with these bears: describes the unbelievable swarms of biting mosquitoes and blackfly; the heart-stopping creaks of the ice that they were forced to walk across pulling the canoe behind them, and the thrills and terror of canoeing through such cold water where a capsize would most probably have been fatal. And, sadly, like most wilderness areas today, there are threats to the Barrens. Climate change is opening up new shipping channels on Hudson Bay, and mining and mineral exploration is increasing. The warming temperatures are beginning to affect the caribou, and the permafrost is thawing. The Inuit community of Baker Lake shows signs of demoralization and welfare-dependency as a once nomadic people become settled, yet rootless. On their second expedition to the area in 2009, John, and Milan Pachlopnik ascended the Hanbury river from its confluence with the Thelon, paddling and pulling the canoe for more than 150 miles and climbing more than 600 feet in altitude. This is thought to be the first ascent of the Hanbury since David Hanbury went this way in 1899. 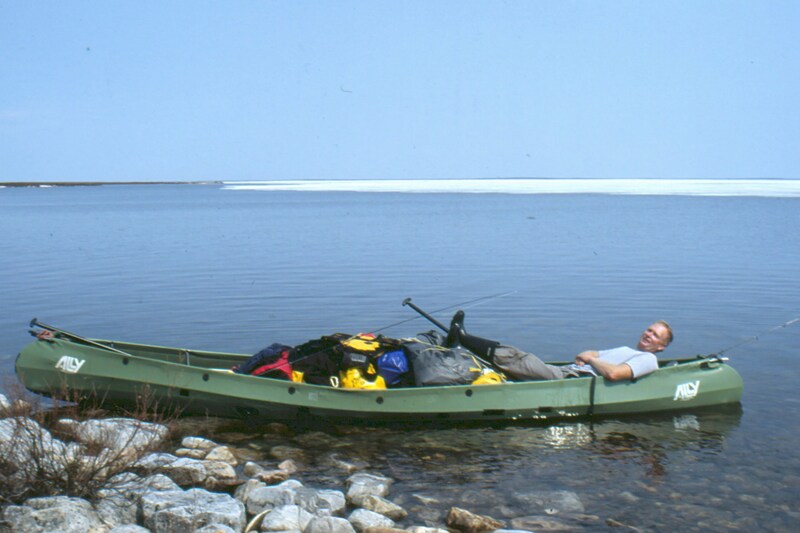 They continued on to Great Slave Lake via the historical and gruelling Pike's Portage. This was the traditional route for trappers who wanted to access the Barrens - carrying their canoes and supplies for several miles uphill.